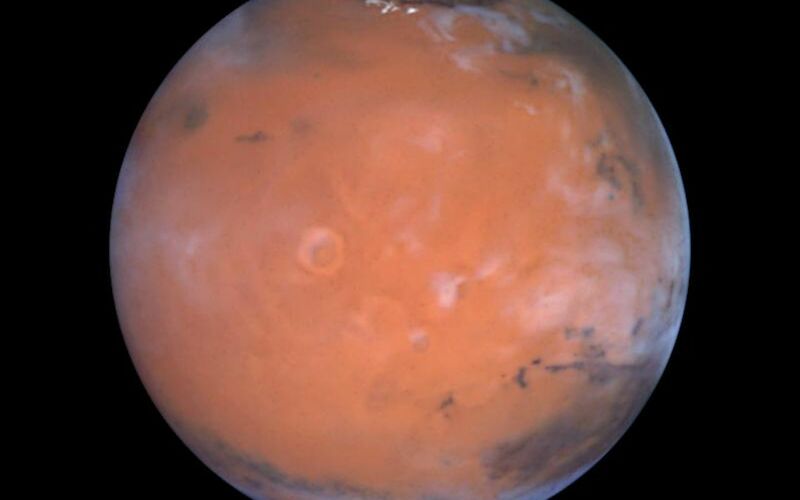 Taking advantage of Mars's closest approach to Earth in eight years, astronomers using NASA's Hubble Space Telescope have taken the space-based observatory's sharpest views yet of the Red Planet. NASA is releasing these images to commemorate the second anniversary of the Mars Pathfinder landing. 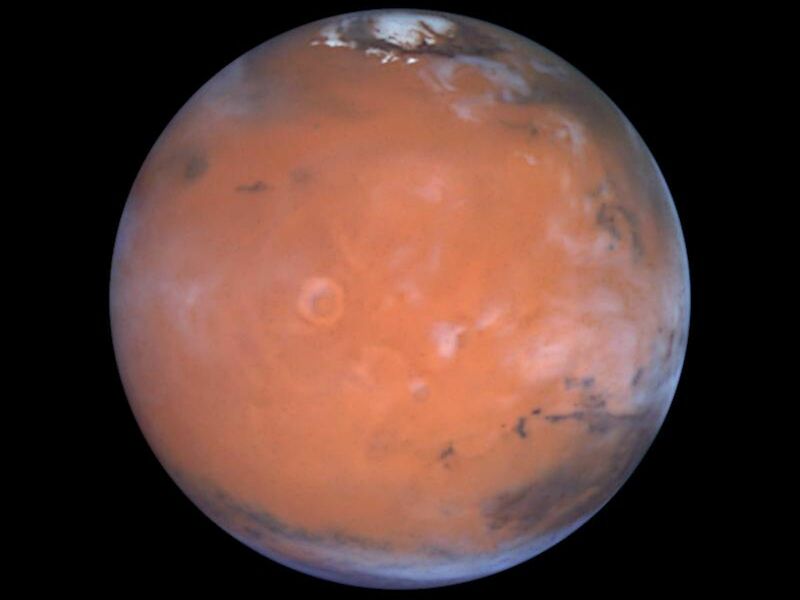 The lander and its rover, Sojourner, touched down on the Red Planet's rolling hills on July 4, 1997, embarking on an historic three-month mission to gather information on the planet's atmosphere, climate, and geology. The telescope's Wide Field and Planetary Camera 2 snapped images between April 27 and May 6, when Mars was 54 million miles (87 million kilometers) from Earth. 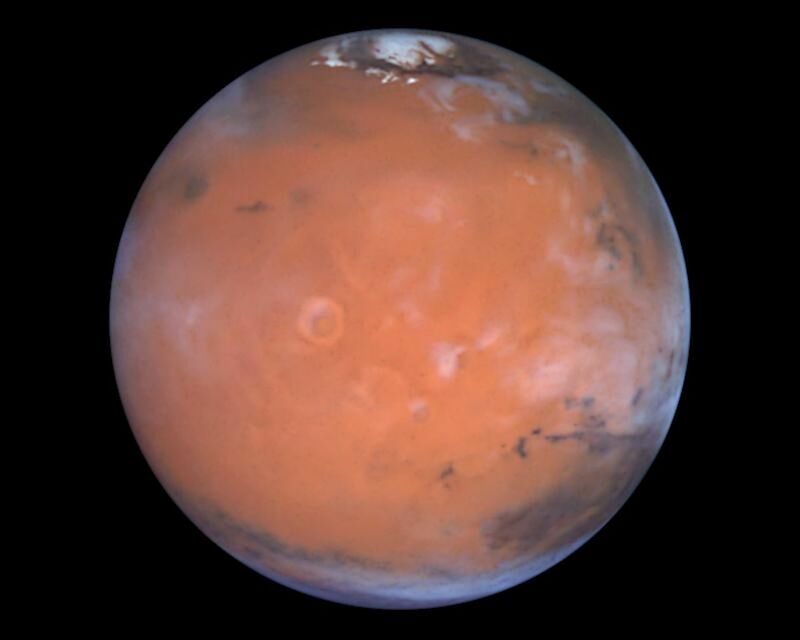 From this distance the telescope could see Martian features as small as 12 miles (19 kilometers) wide. The telescope obtained four images(see PIA01587), which, together, show the entire planet. 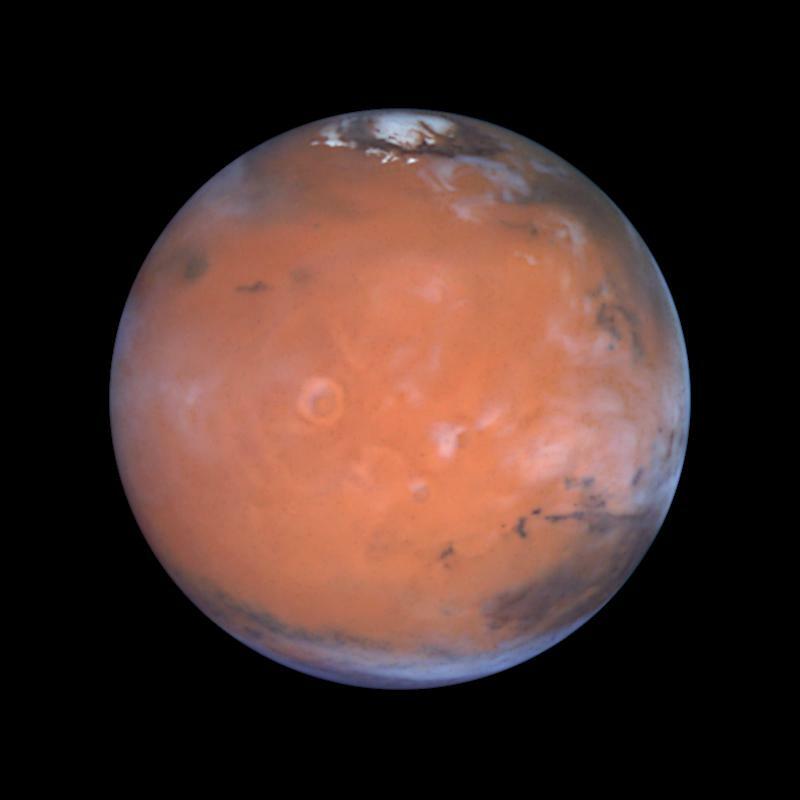 This image is centered on the region of the planet known as Tharsis, home of the largest volcanoes in the solar system. The bright, ring-like feature just to the left of center is the volcano Olympus Mons, which is more than 340 miles (550 kilometers) across and 17 miles(27 kilometers) high. Thick deposits of fine-grained, windblown dust cover most of this hemisphere. The colors indicate that the dust is heavily oxidized ("rusted"), and millions (or perhaps billions) of years of dust storms have homogenized its composition. Prominent late afternoon clouds along the right limb of the planet can be seen. This color composite is generated from data using three filters: blue (410 nanometers), green (502 nanometers), and red (673 nanometers).